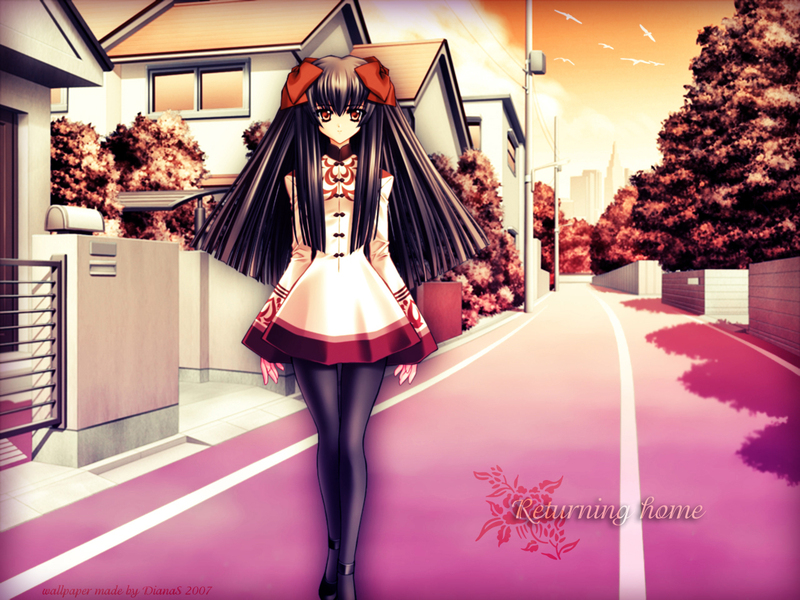 Touka Gettan Wallpaper: Returning home..
Minitokyo »	Touka Gettan Wallpapers » Touka Gettan Wallpaper: Returning home..
Browse Touka Gettan Gallery: Recent | Popular. Nice work! XD I love Touka Gettan! the background looks good and the chara fits in well, but she doesn't look like she would be standing on the road. The background looks good, though the character looks a bit out of place. Also, she seems to have a shadow behind her, which makes it seem like she's standing in front of the wallpaper rather than in it. OMG! this one is just SO beautiful! I just love the scapes you used, it matched up so well. the street look awesome, especially the pink color! woah, this is just so beautiful! oh this one is lovely! It's really one of your best works so far! Keep it up! I just love the bg,the extracted pic [ black bg >.> ...hell of an extraction ] and the really fluffy feel of it all! -wails- I miss coming here to look at everyone's artwork,but it seems lots of folks have forgotten this old vet T~T.Anyway,I really love the bg,colour scheme,and lighting for the wallpaper.Everything seems to pop out with a short of 3d effect due to the vectoring.The girl you used completes the centerpiece for this work.Marvelous work Millia ^-^. So ThAnK Wow Nice !